Catriona Beldame has come to the village of Lochdubh in the Scottish Highlands. The superstitious locals think she’s a witch, and Catriona doesn’t dissuade them from that opinion, claiming that she supplies “therapy and herbal treatments.” She’s bewitched the men who often visit her at night. The women, however, stay away and are surprisingly tight-lipped about the situation. Not long after Catriona files a false report of assault against Hamish, she’s found dead. Hamish investigates the scene which soon goes up in flames. “A lot of superstitious villagers think that either the fire was God’s retribution or the devil had come to claim its own.” Hamish thinks the killer wanted to cover up evidence. The case grows more complicated when sixty-three-year-old villager Ina Braid is inexplicably murdered. Did she see or know something about the crime? No one seems to know or are willing to talk. Then a witness claims to know something, but only tells Hamish about a couple poachers seen in the area. Though its a wee bit out of his jurisdiction and authority, Hamish looks into Catriona’s background. “Aye, I suppose I want to run the case without the responsibility of rank,” Hamish says. He discovers that Catriona may have committed murder before and may have been active in the “game.” There are rumors of a brothel near Lochdubh and another woman in the “game.” But though Hamish hopes the murders were committed by an outsider, the facts suggest someone with intimate knowledge of the village. As reporters descend on the area, Hamish gets some able-bodied help by three women. Lesley Seaton is the forensic investigator on the case. Elspeth Grant is among the reporters covering the murders, and Hamish’s longtime love Priscilla Halburton-Smythe arrives to complicate matters. Hamish may be successful at solving cases, but he’s a bit dense when it comes to matters of the heart. “Do you think he will solve the murders?” asked Perry Gaunt, another reporter on the beat. “He always has in the past. Mind you, there’s a first time for everything,” Elspeth replies. Indeed, this one will stymie Hamish. A month goes by. More murders occur. The aforementioned poachers –and the killer–will target Hamish and those close to him before the case concludes. The richness of the village and its inhabitants who recur in this series may not be readily apparent to a first-time reader. However, it’s not necessary to have read previous installments to enjoy this one. I enjoyed my first visit to Lochdubh and found the mystery vexing in a good way. It is challenging to figure out the who and why behind the murders. The story is a cross between a cozy amateur sleuth and police procedural type mystery. Ultimately, I don’t feel like the clues added up to the killer’s identity, but it was a enjoyable read getting there. 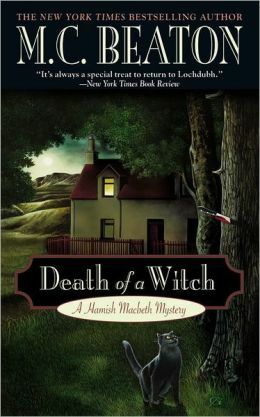 Death of a Witch, first published in 2009, is the 25th book in the Hamish Macbeth series. The series began in 1985 with Death of a Gossip, and to date, all 31 books in the series, except one (A Highland Christmas in 1999), feature “Death of” in the title. In 1992, Beaton began another long-running series, the Agatha Raisin mysteries set in the Cotswolds of Great Britain. M. C. Beaton is the pseudonym for Marion Chesney.